For a few years I collaborated with Looney Tunes artist Chuck Fiala on the webcomic Sword & Sarcasm, a full-color fantasy humor strip. While the strips are still online, I'm pleased to report that you can read them all in one convenient download now, thanks to DriveThruComics! 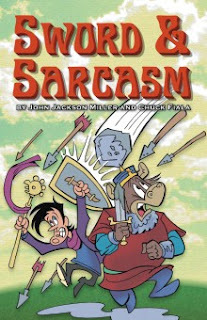 Sword & Sarcasm: The Complete Series download features 170 full-color pages, including a map of where the characters' adventures take them. Herbert is a mercenary minotaur with heart — and a curse, forcing him to serve the most annoying person in the world, Duke Benedict! Follow their misadventures as they meet conniving aristocrats, calculating werewolves, and the slinky cat-girl sorceress, Casmerelda! Sword & Sarcasm was a fun project — glad to see we're getting it back out there. Our plan is to eventually get a print version as well, but we know webcomics readers like e-books! 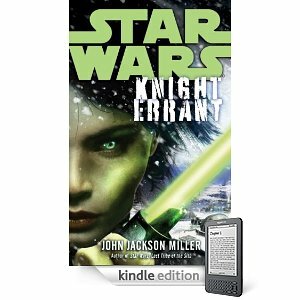 Star Wars: Knight Errant available on Kindle June 28! Random House/Del Rey and Lucasfilm recently reached an agreement to put the entire Star Wars fiction backlist into e-book form — and now you can preorder my Star Wars: Knight Errant novel which releases in e-book form on June 28! You can preorder it from Amazon for Kindle, and also from Barnes & Noble for Nook. You can also preorder all the other Star Wars ebooks that are soon to be available from the retailers; click the link above to visit Amazon's Star Wars e-book section. Sort by publication date and you'll see the books that have been added to the catalog. You'll also see my Lost Tribe of the Sith short stories. Download away — they're free! Free Comic Book Day signing at Chimera Hobby, Appleton. Wis.
11:00 a.m.to 1:00 p.m., and 3:00 p.m. to 6:00 p.m.
Lots of free comics and a special Heroclix figure are on offer this year: you can find the full list of titles here. Signing schedules can also be found on their website. If your local comic shop is not listed, give them a call for a complete list of events and signings. See you in Appleton!